When you need a thorough clean for an outside surface, pressure washing is one of the cleanest and most environmentally-friendly solutions. 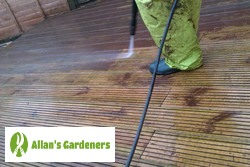 And with Allan's Gardeners taking care of your patio cleaning in London, you can rest assured that you're paying one of the most competitive rates on the market. And that is not the only reason our customers use us for patio maintenance. The reliability of the professional teams we dispatch sets us apart from other companies offering similar services. We don't just drop the equipment at your property and hope for the best. The gardeners we work with are trained and experienced, ready to tackle any task and project, big or small. All you need to do is point us at the target! All the London jet washing team needs is good drainage and a tap and we're good to go! Environmentally friendly - no harmful detergents or cleaning products used, just the power of clean water! What Can You Expect from Allan's Patio Cleaning? You'll see a team arrive properly uniformed and on-time. They'll unload an advanced pressure washing kit from their vehicle and will discuss with you details about the area you need us to clean, assuming you can be present on the day of your service. 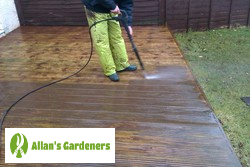 The quote you'll already have received over the phone will be based on what you've told us about the area you need us to clean, and the jet washing experts will confirm this with you on site before proceeding. You're in complete control of giving the go-ahead - there's no obligation. Your patio cleaners will then precisely direct the water from the outlet you've provided to carefully cleanse whatever surface requires the attention. Every technician on Allan's patio cleaning teams has undergone training to make sure they cover all quality and safety requirements. On top of this, we've chosen the most effective modern high-pressure cleaning equipment and machinery on the market to use for the service. With us, you're getting the best-trained professionals with the best tools. It'll only take you five minutes to set up your appointment! And in that time you'll have received a no-obligation quotation, have chosen the time that's right for you out of the seven days in every week that we offer bookings, and been able to ask experienced advisers any questions that you might have.